Local inventors Ryan Enman (left) and Patti Rapaport pose for a portrait outside of the Bangor Public Library. The pair are looking to commercialize their invention for a silent alert system to be used in public schools. 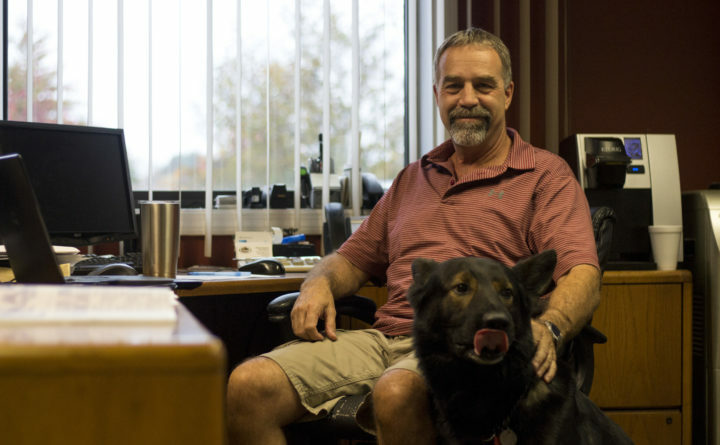 Chad Walton, president of SnapSpace Solutions in his Brewer office with his German Shepherd, Havoc. Walton has been an entrepreneur in Maine for nearly 40 years. Habib Dagher demonstrates the light weight of his invention "Bridge in a Backpack." The invention was honored by the U.S. Department of Transportation in 2015 and has been used to build bridges in the United States and overseas. Editor’s note: This is the seventh piece in an ongoing series seeking to understand how the Bangor region could grow its economy. Read the rest here. Many of Maine’s most innovative products are the result of people’s desire to improve the world around them. But what it takes for them to turn those ideas into businesses is far from simple, often requiring not just time and money, but technical specialization, business savvy and a bit of luck. Understanding how, exactly, people become inventors can inform others pursuing similar paths or those trying to boost entrepreneurship on a broader scale. 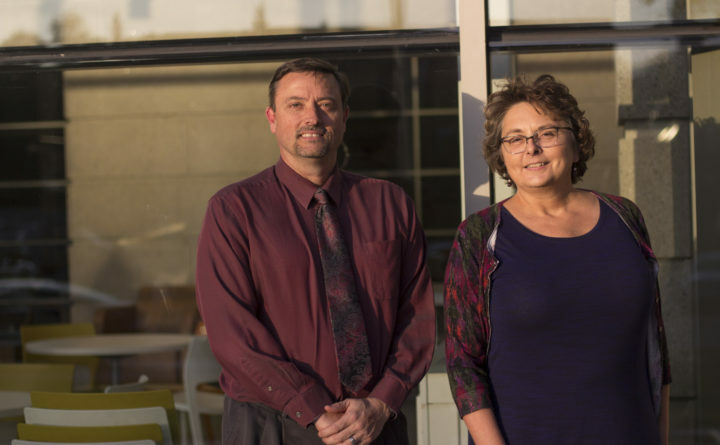 The BDN recently interviewed four patent holders from the Bangor region to learn where they get inspiration for their ideas, the hurdles they encounter, and what other aspiring inventors might want to know before taking the jump and quitting their full-time job. The following interviews have been edited for clarity and condensed. Chad Walton holds a patent for shipping containers remodeled into cell towers. Positioned upright, covered antennas can be situated on top of the shipping containers, with sensitive electronic equipment stored inside. He has operated his company, SnapSpace Solutions, for seven years and also uses shipping containers to build homes, office spaces and extra storage for clients. Over the last 38 years he has owned and operated a number of other businesses, ranging from building and selling campgrounds in Eddington, to owning a real estate company that operated an aircraft hangar in Houlton and a mobile home park in Bangor. Where did you get the idea for the patent? We patented the tower because we could build it in one day, on site, versus it being a long, drawn-out process typically for building on site. Every cell phone company that uses them, we can save them approximately $100,000 on the equipment that goes inside of it versus a standard tower. So it’s a big cost savings; it’s big time savings. They can get it turned on weeks and months faster than they could turn on a typical cell phone tower. So there’s huge advantages. Why do you think there aren’t more inventors and entrepreneurs in the Bangor region? Because it’s risky. Very risky. I did it all out of pocket. It takes so much time to go after public funding, local funding and help in that way that for me it wasn’t worth the time to spend that much time in that area. Someone who comes out of the university system, that’s worked in the university, that understands that whole end of it, has a big advantage over someone like me that didn’t. How could the Bangor region better serve aspiring entrepreneurs? There’s no help on the front end, and that’s where businesses need it. If you wanted to do a startup company right now, you need help on the front end. There’s all types of help and breaks on the back end, but there’s no help on the front end. If I hire 10 people, I can get some of their wages refunded next year. But I got to make it from today, through next year. I’ve got to keep the lights on. I’ve got to pay the mortgage on the place. I’ve got to pay these people for a full year on a startup company. Well, how do you do that with zero sales? I have to go from zero sales to the first sale. Then I have to get the second sale and the third sale. Patti Rapaport and Ryan Enman hold a patent for the design of a silent emergency alert system to be used in public schools nationwide. They are still looking to raise money to build a prototype but envision the device being clipped onto clothing and set to flash colors or vibrate in case of an emergency. Their inspiration for the idea came following the 2012 shooting at Sandy Hook Elementary. What are some things aspiring inventors should know based on your experience? Enman: You need to have some folks who are knowledgeable that can help point you in the right direction to start with [to build and sell a device]. Otherwise you’re going to spend a lot of time figuring out where that direction is. We had no knowledge of this area, so it’s definitely not our area of expertise. But there’s a lot to it. Start to finish in getting our patent, we applied for it in May of 2013, and we were granted it in August of 2016. So it took over three years to get the patent granted. And then parts of it were granted, and then we had to reapply, and then additional parts of it were granted. What resources did you need to get through the patent process? Rapaport: Our checkbooks. We have applied for, and we did receive, one grant through the Maine Technology Institute last January. We had already done a lot of the work on the patent already, so that grant is for the development of our business plan and market analysis. But that’s a very small cost compared to the legal fees we paid for the patent process. The patent process itself, that was the easy part. It took three years and cost between $6,000 and $7,000, but it was the easy part. What has been your biggest roadblock during the invention process? Enman: The problem comes with the prototyping [developing a model that can be replicated and sold]. Our prototypes are not in a place where we could market them. So we need to get prototypes developed by someone who can make them practical and dependable. And that’s where we’re at right now, which can be extremely expensive. We’re working with some different folks who do prototyping now, trying to get a clear picture of the costs. But it’s probably going to be over $100,000 to get the prototype done. Do you think that what you’re trying to do would be easier in another part of the country? Enman: There’s so many other folks, like University of Maine at Orono, who have been very helpful, but we’re not at the top of their priority list to help out, so we have to get in line. Which is okay, but obviously if there were more universities, more of those programs or more companies that could do it, we might be able to get further off the ground. 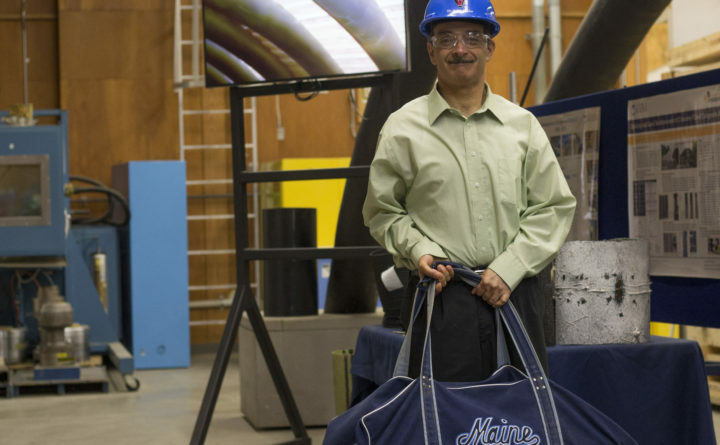 Habib Dagher has secured dozens of patents during his 27 years at the University of Maine. A world-renowned inventor, his “Bridge in a Backpack” — where inflatable arch structures are filled with concrete on site to support the creation of a bridge — has been honored by the White House as well as the American Society for Civil Engineers, the largest civil engineering group in the world. The first patent related to a way of building bridges using a press lamination system. We actually took 2-by-10 lumber and 2-by-12 lumber and creased, pressed and squeezed it together perpendicular to traffic to build a bridge deck using composite materials. Since then we’ve built some bridges using this technology. What advice do you have for other people who are starting out where you were 25 years ago? I think the biggest advice is to really vet what you’re doing and make sure that it has a good market opportunity — it can be commercialized. And talk to trusted people if you wish about the field as a whole. Is it worth really patenting? Because you can spend a lot of money patenting and a lot of time, and at the same time this may not be a market that’s big enough or is worth spending time patenting. And just because you have it patented also does not mean necessarily that you’re going to commercialize, or you’re going to make money out of it. Plus, you need to be prepared to defend it. If you don’t have the resources to defend it in court, it’s not really very valuable. What steps do you go through from having your idea, to creating a patent? The most important part of the process is, you have to ask yourself, ‘Do I have something unique? Do I have something valuable? Do I have something that is patentable and nobody else has developed?’ If you have an idea you think is big and has a lot of big opportunities, then you really need to do a patent search to see if your idea is already out there, or if somebody has already done something like that. What do you do when you get discouraged with an idea? We all have our ups and downs, of course, in everything that we do. But at the same time that shouldn’t drive you away from your mission. One of my favorite sayings to tell people is, ‘Success is what you do in between failures.’ If you’re afraid to fail, you’re never going to succeed because you never try. So I think that’s an important motto for anyone who is trying to change the world around you. Because you’re not going to get it right every time. And if you’re afraid to not get it right or be ridiculed by others, then it’s not going to work. If you believe in what you do, you should pursue it. Interested in meeting local business owners and entrepreneurs? Come visit the Bangor Daily News at 5 p.m., on Thursday, Oct. 26, at our offices at 1 Merchants Plaza in downtown Bangor as we host a Bangor Region Chamber of Commerce after-hours event where we’ll be talking about how local businesses can work together to help the region grow.